Two fly species, the black soldier fly, Hermetia illucens, and the house fly, Musca domestica, are presently being promoted and used as feed for monogastric animals. Various production systems are being developed in different contexts and regions, from very small-scale used by smallholder farmers to industrial scale production factories. This chapter reviews the information available on production methods for the two fly species, with a focus on small-scale production systems. Larvae of both fly species can be produced either by exposing substrates to attract naturally occurring flies, or by breeding adults to obtain eggs that will be placed on the larval rearing substrates. The two fly species are compared with respect to performance, user-friendliness, safety and sustainability. The advantages and disadvantages associated with rearing these species in different situations and perspectives are highlighted. This chapter also discusses knowledge gaps and provides recommendations for production and suggestions for further research. This review was made in the framework of the project PROteINSECT of the European Union’s Seventh Framework Programme for research, technological development and demonstration (grant agreement no. 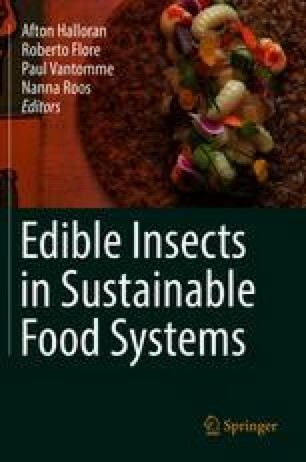 312084) and the project IFWA – Insects as Feed in West Africa, funded by the Swiss Programme for Research on Global Issues for Development (R4D).